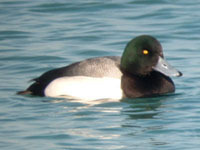 The north-south axis of Lake Michigan forms a natural corridor for migrating waterfowl. During March and again in October and November, almost all of the regularly occurring ducks in the Chicago area can be seen moving past Montrose Point or resting on the lake or inside the harbor. The best place to look for waterfowl at Montrose is from the Fishing Pier, though if waves are crashing over the pier you'll be taking your life into your hands if you venture onto it. Surf, Black, and White-winged Scoters are regular in small numbers in late fall, and White-winged Scoters are regular in late winter and early spring. Though never common, Harlequin Ducks have been found close to shore or even inside the Harbor during the colder months of the year. In past years, hundreds of Red-breasted Mergansers used to gather in the waters off Montrose Point in early April to feed on smelt, a small schooling fish that moves into the inshore waters of Lake Michigan to reproduce. Such large concentrations of Red-breasted Mergansers in spring are rare now. Though less common now than in previous years, a few Long-tailed Ducks can still be seen in late fall, winter, and early spring. Occasionally one will show up close to shore or even inside Montrose Harbor. Most geese, with the exception of Canada, are rare at Montrose, though Cackling and Snow Geese are seen occasionally, especially in late fall. Ross's Geese have been recorded a few times. Tundra Swans are sometimes seen in November and December, mostly flying east over the Point.